BBC Wales' Torchwood has been commissioned for a second series and this time the sci-fi thriller will be shown first on BBC Two. 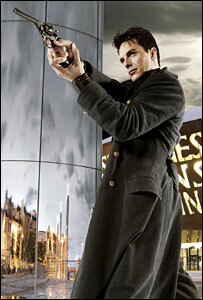 The first series starring John Barrowman as time-travelling Captain Jack has smashed viewing records. An audience of 2.4 million tuned in for the episodes one and two of the first series, which is showing on BBC Three. It was the highest audience for that channel and the highest ratings for a non-sport programme on digital TV. Created by the writer of the new Doctor Who Russell T Davies, Torchwood (an anagram of Doctor Who) is produced by BBC Wales in Cardiff, where the series is set. The storyline follows a team of modern day investigators as they use alien technology to solve crime, both alien and human. Swansea-born Russell T. Davies, also the creator of Queer as Folk and Second Coming, said: "The whole team is bristling with ideas and we are delighted that Cardiff is going to be home to more monsters and mayhem." The series, which is screened after the 9pm watershed, is aimed at a more adult audience than the family-orientated Doctor Who, where Barrowman's Captain Jack character first featured. BBC Two controller Roly Keating said: "Inventive, intelligent and unpredictable, Torchwood is a brilliant piece of 21st Century fantasy drama. "I'm delighted that its second series will be premiering on the channel." Filming for the second series is due to start in Cardiff next spring and the programmes will screen later in 2007.